Prominent & Leading Manufacturer from Jaipur, we offer hand knotted ikkat carpets, handmade ikat carpets, hand knotted ikat carpets, ikat rugs, ikat carpets for floors and floor ikat carpet. We are interested in International queries from USA, Europe, Canada, Middle East and Germany. 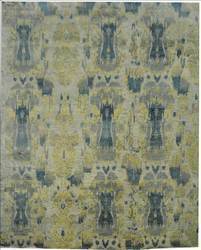 We offer to our clients Handmade Ikat Carpetswhich are made up of very fine wool quality. We are also exporting our products to different markets. They are available in various designs & colors. We are seeking International queries from USA, Europe, Canada, Middle East and Germany. Leveraging on our vast industrial experience in this domain, we are committed towards offering wide gamut of Hand Knotted Ikat Carpets. 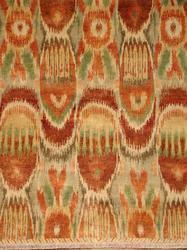 Offered hand knotted ikat carpets comprise distinct collection that is highly attractive option to use and assist in adding a distinguished look to floor area where these are used. 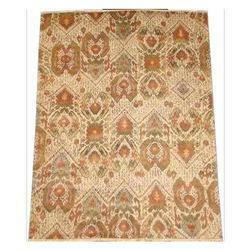 These offered carpets are available in different pattern, colors and design choices. Further, these provided carpets can also be customized as demanded by customers. These offered hand knotted ikat carpets are available in different size choices, it’s artistic and fine crafting work also makes these preferred choices of the customers. 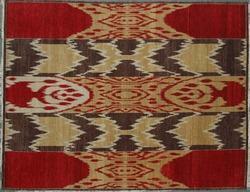 We offer to our clients Ikat Rugs which are made up of very fine silk quality. We are also exporting our products to different markets. They are available in various designs & colors. We are engaded in manufacturing and exporting of the Ikat Carpets. These are exclusively designed and developed these carpets are extensively admired for their unique designs, excellent finish and designer appearance. We are the leading organization actively engaged in offering an extensive array of Floor Ikat Carpet. This offered carpet is carefully woven by our experts with the use of superior quality yarns, thread and modish technology in compliance with industry set standards. Exclusively designed these floor ikat carpets are extensively admired for their excellent finish, unique designs and designer appearance. Following the precise demands of clients, we provide these carpets in various standard sizes and designs. This floor ikat carpets will provide a royal look to your home décor. We are engaged in manufacturing, exporting and supplying excellent quality Ikkat Carpets to our valuable clients.Ikat, or ikkat, is a dyeing technique used to pattern textiles that employs resist dyeing on the yarns prior to dyeing and weaving the fabric. To meet the precise demands of clients, we manufacture and supply a designer collection of Hand Knotted IKKAT Carpets. Fabricated from optimum quality fabrics, these carpets are extensively durable and admired for their uniqueness, lightweight, and excellent color combination. With the availability in all standard sizes and finish, these carpets are available with us at budget friendly rates. We are one-step ahead of our competitors in manufacturing and supplying a unique range of Hand Knotted Ikat Carpets . With the availability in variety of designs and color combinations, these carpets are widely preferred by various numbers of clients. 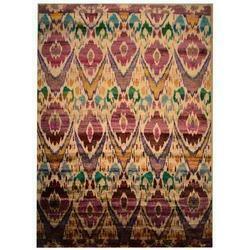 Customers can avail these Handmade Ikat Carpets in variety of patterns and styles as per their precise demands. 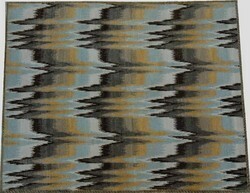 We offer our Handmade Ikat Carpets at very affordable rates. We are looking International queries from USA, Europe, Canada, Middle East and Germany.